I recently got my hands on a netbook. 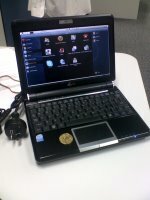 An Eee PC 901 (Linux) to be exact. Not only is it my first foray into the world of portable computing, it is also the first time I’ve used a Linux distribution in a serious fashion. $1 coin and standard power plug included for size reference. As you can see, this is a small device. I thought this would have caused more problems than it has, but luckily it was surprisingly easy to get used to. The keyboard feels solid and isn’t as ‘floaty’ as other laptop keyboards I’ve used. I’m struggling to get used to the trackpad, but that most likely has more to do with my lack of experience with them, rather than any particular shortcoming with the device itself. If you’re not a tech-head, skip this paragraph. The specs of the machine are as follows: 1.6Ghz Intel Atom Processor, 2gb of RAM (after market upgrade from 1gb), 8.9 inch widescreen @ 1024×600, 20gb SSD, 6 cell battery, Wifi b/g/n, Bluetooth, 1.3M Pixel webcam, 3x USB, VGA output, RJ45 Ethernet, Mic in, audio out, SD Card reader. This all weighs in at a very portable 1.2kg. Those of you with good eyes will have noticed that I’m not running the standard Asus-stamped Xandros distribution of Linux which ships with this product. I have installed an Ubuntu variant known as eeebuntu. I stumbled across a link to it in an article from Gizmodo, a blog which I highly recommend that you have a look at if you like tech. The disadvantage to using eeebuntu is that you suffer a reasonable performance hit, most notably during boot. The boot time goes from around five seconds, to twentyish. The advantages easily outweigh this small problem as eeebuntu is vastly more functional than Xandros due to its extensibility and stability afforded to it by the Array kernel. The beauty of the 901 over the 900 series is the fact that Asus have addressed the controversial battery issues. I thought I’d test this using my super-scientific method: I played a looped DVD quality video in fullscreen at normal brightness with the battery charged to 100%. The machine was able to sustain this for about 4:45 before the battery went completely dead. Please note that I did not take into account the fact that I had left the wifi and bluetooth adaptors on during this test. It would be reasonable to assume that this performance would be enhanced by using the original Xandros operating system. I think the thing that excites me most about this technological acquisition isn’t the acquisition itself, but the ‘connectedness’ it affords. I spend the vast majority of my time within range of wireless networks. Internet connectivity is something to which I have become accustomed and do not enjoy being without. Having a machine which has a full keyboard, internet access, work applications and excellent portability, all without having to rely on our horrendous 3G network makes me a happy geek indeed. In conclusion I highly recommend this system if you are after a low-power/low-cost laptop. They are portable, usable, quiet, cheap and reliable. Expect more posts of a ‘liveblogging’ nature in the future.